Balad party dismisses criticism of MK Zoabi, says the “Israeli occupation” is to blame for recent violence. 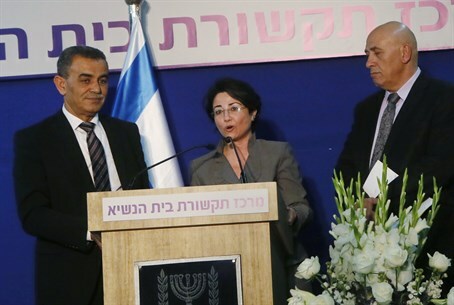 The Balad party, of which MK Hanin Zoabi is a member, dismissed on Tuesday evening the criticism that was leveled at Zoabi after she justified the kidnapping of three yeshiva students by Hamas. In a statement, the party also blamed the “Israeli occupation” for recent violence. “The mad cries of revenge by Foreign Minister Avigdor Liberman, the Jewish Home, MK Miri Regev and others, are proof of the Israeli political system, which does not want to hear a different voice that is not aligned with the nationalist consensus, which sanctifies aggression, occupation and settlements,” said the party. "Balad and MK Hanin Zoabi see the Israeli government as responsible for the continuing violence and bloodshed. The occupation is the source of violence, and the way to prevent violence is to end the occupation and to take a path of serious dialogue on the basis of UN resolutions,” Balad’s statement read. Zoabi’s comments on the kidnapping came in a radio interview, in which she stated that the "kidnappers are not terrorists" and that the kidnapping is a "last resort" for Palestinian Arabs frustrated by their lives. Following the comments, Culture Minister Limor Livnat (Likud) announced that she intends to turn to the Attorney General demanding an investigation into Zoabi’s comments and whether they can be classified as an offense under Section 144 of the Penal Code against "incitement to violence of terror."